The world’s biggest audio OB truck, which expands to 13.5×5.5m, has been delivered to the Zheijang Radio & Television Group, China’s fourth largest radio and TV broadcaster. 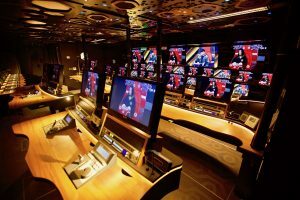 It joins a 32-camera IP-based UHD OB (which has been claimed to be the world’s largest IP-based video truck) and a third truck that connects both production units, all of which have been designed for Sony by Project Builders in Belgium, and coach built by Carrosserie Akkermans in the Netherlands. 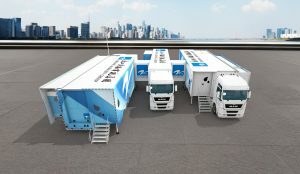 The sound truck is a double-expanding trailer, but has managed to meet recording studio standards of sound isolation, thanks to unique 10cm composite walls that give it an Rw value of 57dB between 100Hz and 20kHz, “which is exceptional for an expanding truck,” said Sam De Pauw, business development director, Project Builders, which is part Videohouse (and therefore of Euro Media Group). Because it expands, the joints on both sides have also had to be pressurised to seal them. “It also has a complete floating floor in the main production area, which is very complex and heavy,” said Eddy Brants, designer of both large trucks. Weight was an important consideration in the build, as it neared the 40-ton Chinese limit. All of the audio OBs Project Builders has made previously have been single bodies, which are a lot simpler to acoustically isolate than expanders with all their gaps. One of ZRTV’s most popular shows is Sing China!, which is transmitted in 5.1 audio, and it does a lot of other music-based programming, which is why it wanted the best it could get for its OB audio production. control room and a 5.1 set-up in a lounge/listening area, which can also be converted into a production room. 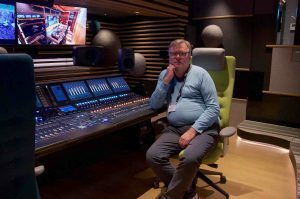 It is equipped throughout with Genelec SAM monitoring, and has a Lawo mc²66 mixing console in the main Dolby Atmos production room A with a mc²56 console for the 5.1 production control room B. For video it has a translucent THX-approved motorised projection screen with a Sony VPL-VW300ES 4K projector. The IP OB truck was delivered in August, and is the most advanced that Sony has deployed in China, with full HDR and IP capability. It uses 32 HDC-4300 cameras (and can support more), and can do simultaneous UHD and HD production using both IP and SDI video routers. 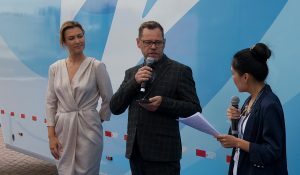 The OB truck will be used for a wide range of live productions, including those for OTT and social media platforms, which are in increasing demand in China. “They wanted to put a lot of people in [up to about 36], with a lot of open space, which is not easy in a truck with sound isolation,” said Brants. They also wanted a truck that looked different, so everything was custom made to suit their look and feel. It is using Sony XVS-8000 and XVS-7000 IP switchers, Sony PWS-4500 IP Server, with two Sony NXL-FR318 IP 3RU frames and 13 NXLK-IP40F 4K/IP conversion boards, running under an IP Live System Manager high redundancy dual system controller. It also uses Sony PVM-X550 UHD monitors, HDRC-4000 UHD HDR, SDR, dual channel and format cross converters, an Evertz evEDGE6-FR+PS core switch, and a Lawo mc²56 audio console with 5.1 Genelec Monitoring, plus various D*AP8 MAP, D*AP TAP and D*AP VAP processors from Jünger Audio. The systems integrator for all the trucks was New Digital Technology Holdings. Sony has also been central to the fit-out and completion of ZRTG’s new 42-storey Zhejiang International TV Centre in Hangzhou. The broadcaster delivers more than 450 broadcast hours a day via 12 TV channels and eight radio channels. Audio is a major consideration here too, and ZRTG has installed multiple Jünger Audio processors, including D*AP8 MAP Edition surround monitoring audio processors, a D*AP8 TAP Edition television audio processor and a D*AP4 VAP Edition two channel voice audio processor, in the new production centre. Studio Manager (VSM), making it the first full networking of broadcast studios in China, with central routers distributing every signal required to be accessed by all of the studios within the centre. Its main studio network comprises four large interconnected via a Lawo Nova73 routing system and video routing systems controlled and monitored by VSM. For the production of Sing China!, the broadcaster uses one control room for multitrack recording and final mixing, another control room for live music mixing, and the third control room for full backup. Using this setup, the Nova73 router also provides microphone management – there is a GUI in the 56-fader mc²66 consoles in each control room to define which has the control rights for mic preamps on each card.